Opposition parties in the hills today strongly condemned the remarks of Gorkha Janmukti Morcha president Bimal Gurung who yesterday appeared to suggest that the two Gorkha representatives in the Indian Constituent Assembly were not dedicated enough towards the cause of separate state for the community. Gurung in his remarks had said but for the mistakes made by Damber Singh Gurung and Ari Bahadur Gurung, both of whom were members of the Constituent Assembly at different times in the 1940s, the Gorkhas wouldn't have been reduced to begging for a separate state till today. "I feel ashamed to call myself a Gurung. Had Ari Bahadur Gurung and Damber Singh Gurung dedicated something to this land for our sake, maybe, we wouldn't have been begging like this... I have to make up for the mistake they made. I have to rectify their mistake. Had they rectified themselves then, I wouldn't have to beg like this," he had said while addressing a small function to lay the foundation stone of a road here. .
Harka Bahadur Chhetri, the president of Jana Andolan Party, said it was very unfortunate that a person who had very little knowledge of history should talk about people who were instrumental in making the Gorkhas across the country aware of their political rights. "When a person who doesn't know history starts talking, this is what happens. It (Gurung's remarks) is very unfortunate. Our political history begins with people like Damber Singh Gurung...In pre-independence India, it was he who travelled across the country to make the Gorkhas aware of their political rights," he said. Apart from being members of the Constituent Assembly, both Damber Singh and Ari Bahadur were lawyers. Ari Bahadur became a member in place of Damber Singh, who died in 1948 when the Indian Constitution was still being drafted. Ari Bahadur was among the signatories to the Constitution when it was adopted on November 26, 1949. Damber Singh was also the founder of Akhil Bharatiya Gorkha League (ABGL) and Ari Bahadur its member. In fact, the GTA had a little over two months back installed the bust of Ari Bahadur at Lal Kothi, its headquarters in Darjeeling, to recognise his contribution to the Gorkha community. The Morcha had also honoured him posthumously at an event to celebrate Constitution Day on November 26, 2015. Pratap Khati, the ABGL secretary, said he condemns Gurung's remarks in the strongest possible terms. "The man (Gurung) doesn't know history. He has no right to comment on such tall leaders like Damber Singh and Ari Bahadur. Damber Singh is the father of the Indian Gorkhas. 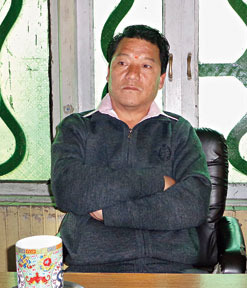 Gurung has not done an inch of what the other two have done for our community," he said. When contacted, Morcha secretary Roshan Giri said he was not aware of Gurung's statement. "I am not aware of it, and I can only comment once I see them," he said. An observer said that the Morcha president's remarks were not expected to go down well with the Gorkhas not just in the hills, but across the country because both Damber Singh and Ari Bahadur are held in such high esteem. "What is it with Gurung that whenever he is in Kalimpong, he comes out with such outlandish statements? Remember his raising doubts about the incorporation of Kalimpong in India when the demand for Kalimpong district was picking up steam about a year-and-a-half back. This is committing political hara-kiri," said an observer. The JAP president said the remarks also betrayed Gurung's sense of frustration at not being able to retain his grip in the hills. "He is losing his grip because of which he is baffled. He doesn't know what he is talking about," he said.